A showdown with Democrats to raise the debt ceiling turned into a Republican rebellion Thursday night that forced House Speaker John Boehner to abruptly pull his legislation from the floor to court his own caucus for votes. Republicans and freshmen Tea Party members filed into the speaker’s office for last-minute arm-twisting, but many left saying they still planned to vote no, some making their way to the chapel to pray. Rep. Hal Rogers (R.-Ky.), the powerful Appropriations Committee chairman, was reportedly seen ushering the lawmakers into Boehner’s office. Other Republican lawmakers who remained no votes after meeting with Boehner include Jason Chaffetz of Utah, Jeff Flake of Arizona, and Jeff Duncan and Mick Mulvaney of South Carolina. Earlier in the day, Boehner said at a press conference that his compromise was the best deal for Republicans. “The bill is not perfect, I never said it was perfect, no one in my caucus thinks it’s perfect,” Boehner said. This is the second plan in as many weeks House Republicans have sent to the Senate to avoid default. With the Aug. 2 deadline approaching, Democrats have not put their own plan on the floor for a vote. Neither has Obama offered a plan for action. Senate Majority Leader Harry Reid kept his caucus on standby, declaring that within minutes of House passage, he intended to bring up Boehner’s Budget Control Act of 2011 and defeat the measure. The legislation would reduce the deficit by $917 billion over 10 years, while allowing a short-term rise in the deficit ceiling of $900 billion. It would cap discretionary spending and create a bipartisan congressional committee to recommend future spending cuts. The measure also requires both Houses to vote on a Balanced Budget Amendment to the Constitution by the end of the year. The House was planning to vote on the amendment Friday. During the debate Thursday, Democrats called Boehner’s bill “a sham,” “abusive,” “slash-and-burn politics,” “radical,” a “manufactured crisis,” and one that will bring “historical hardship” and “poverty,” and kill millions of jobs. “What we’re trying to do is save the world from the Republican budget,” said House Minority Leader Nancy Pelosi (D.-Calif.). “We’re trying to save life on this planet as we know it today,” Pelosi said. Rep. David Dreier (R.-Calif.), chairman of the House Rules Committee, said no such items are in the bill. “I’ve gone through it, and I just don’t see it,” Dreier said. “There are in fact exemptions in this bill to make sure Social Security and Medicare are not touched. Those saying this measure will bring about those cuts are mischaracterizing the bill and have not read it,” Dreier said. “A manufactured crisis? Who went on television to scare senior citizens that their Social Security might be in doubt? President Obama,” said Rep. Paul Ryan, (R.-Wis.), chairman of the House Budget Committee. James Lankford (R.-Okla.) said the bill is a bipartisan, middle-ground compromise. “It’s not the draconian monster that has been described,” Lankford said. Dreier said the debt ceiling has been raised 75 times since 1962 without debate, policy changes, or any strings attached. “That approach is precisely the fundamental problem,” Dreier said. A battle that initially pitched Republicans against the Obama White House degenerated this week into an inner-party squabble between Tea Party freshman holding our for tougher cuts and Boehner, who brokered the compromise. According to the National Journal, Republicans intending to vote no include Todd Akin of Missouri, Justin Amash of Michigan, Michele Bachmann of Minnesota, Paul Broun of Georgia, Jason Chaffetz of Utah, Jeff Duncan of South Carolina, Trent Franks of Arizona, Phil Gingrey of Georgia, Louie Gohmert of Texas, Trey Gowdy of South Carolina, Tom Graves of Georgia, Tim Huelskamp of Kansas, Jim Jordan of Ohio, Jeff Landry of Louisiana, Connie Mack of Florida, Mick Mulvaney of South Carolina, Ron Paul of Texas, Dennis Ross of Florida, Steve Southerland of Florida, Tim Scott of South Carolina, Joe Walsh of Illinois and Joe Wilson of South Carolina. Republicans leaning no include Jeff Flake of Arizona, Steve King of Iowa and David Schweikert of Arizona. Discontent spread to the blogosphere and talk radio, where conservative organizations such as Heritage Action and Club for Growth lobbied against Boehner’s plan. Republicans did make some inroads in the debate process—taxes were off the table and the Senate Democrats’ plan agreed that trillions of dollars in spending cuts are needed. “Even more shocking is the fact that Democrat leaders and the President himself have endorsed every feature of this legislation except one: And that’s the fact that it doesn’t allow the President to avoid another national debate about spending and debt until after the next presidential election,” said Senate Minority Leader Mitch McConnell (R.-Ky.). “This assurance is the only thing the President and Senate Democrats are holding out for right now,” McConnell said. 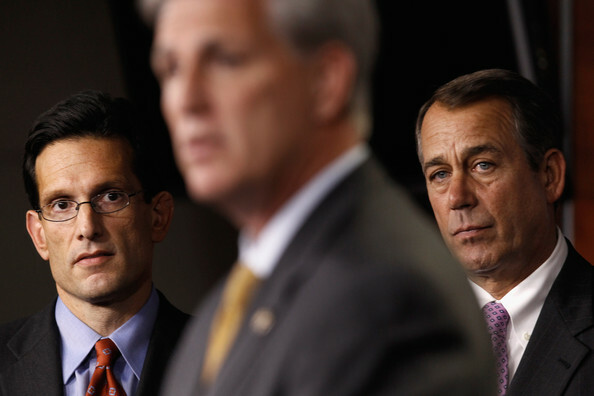 via Republican Rebellion Stalls Debt-Ceiling Vote – HUMAN EVENTS.